Ed Sheeran's Sing is apparently stuck in a CD player at Radio 1, given the frequency with which it comes around on rotation these days. Not that I'm complaining, the Pharrell-produced track is his best to date. A funky little reminder of what Justin Timberlake used to sound like before he started making, like, freaky psychedelic 20-minute jams, y'all dig? 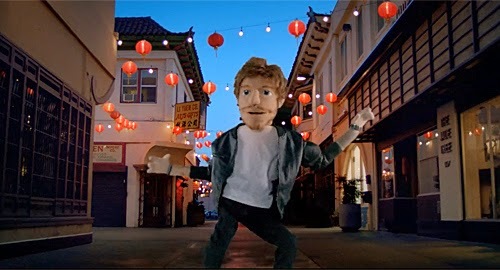 The video has just "gone live on Facebook" and it stars a hard-drinking, stripper-lovin' Ed Sheeran puppet that's bound to be a must-have gift come Christmas time. It even comes with life-like tattoos and designer stubble. So cute.